Hitori Tori, a.k.a. Canadian Renoise veteran Julian La Brooy has been kicking up a stir lately with his impressive videos of innovative Renoise jamming. See Hitori Tori - Renoise Techniques for some examples. We decided to get in touch for a little interview that should hopefully provide some more insight into his working process. Where does the name Hitori Tori come from? Well, it's a long story but I'll try and keep it brief. In the late 1990's my friend and I formed a tracker-based electronic band called finch. After producing numerous albums together, which we never released, we abandoned the project and I moved to Japan. I was producing a lot of music alone at the time and really needed an artist name for my solo stuff. Maybe something in Japanese? Maybe another bird reference? So, I chose hitori (which means alone) and tori (which means bird). Hitori Tori. This name just made sense to me at the time. Can you tell us a bit about the Ohm Controller that you're using? The Ohm64 is made by a small company in Texas called Livid Instruments. I discovered it online while looking for something tactile to control multiple instances of Renoise. I had been using a smaller controller made by another company, but I couldn't take myself very seriously when playing a live show with it – especially since its components kept breaking. From what I could tell, the Ohm64 looked pretty reliable and sturdy. I also wanted potentiometers that were not infinity knobs – because those can be problematic in certain situations. The Ohm64 is an easily programmable blank slate, and I guess that's what attracted me to it. What exactly do you assign the grid buttons to? Are they always set to trigger different patterns in Renoise? In my current set-up the grid buttons are assigned to do either of 2 things. 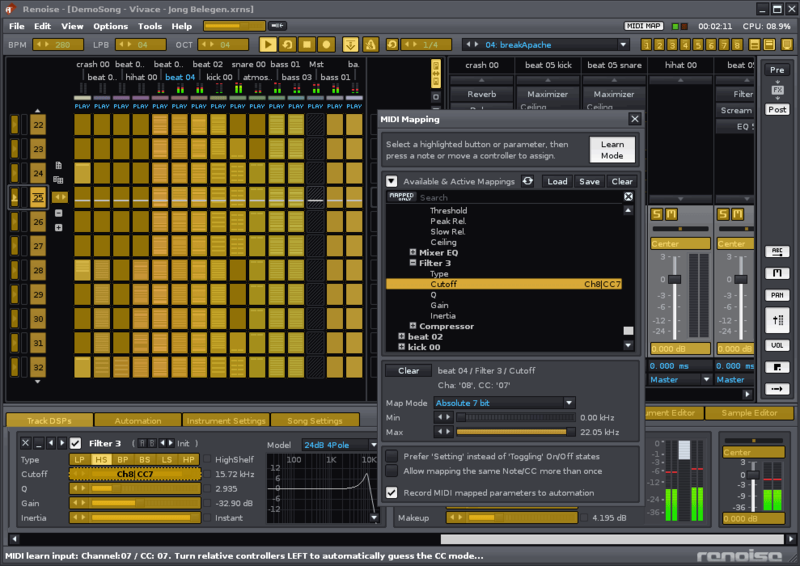 1) To select patterns in the Renoise song sequence (usually containing offset sample elements), or 2) to juggle short vocal samples in the background while Renoise is playing, using a Max MSP application called mlr. In the latter case I typically assign all the samples to the same group; allowing for more random style cut-ups. How do you handle multiple Renoise instances and how do you separate the MIDI messages going to the different instances? Once assigned, the mappings stay locked to the songs. MIDI communicates with all Renoise instances simultaneously and there aren't any issues of conflict that I'm aware of. Incidentally yesterday I had seven instances of the Renoise application open at once and everything was just fine. Once you've made a new track, how much preparation do you need to do before being able to perform a live set like the ones in your videos? In other words, how big is the step from finished Renoise track to live-performable Renoise track? Actually, the funny thing is, it feels like less work is needed. I needn't even finish the songs before performing these live sets. I usually play unfinished songs and just blend them into each other. If you're like me, you've got hundreds of these 'almost complete' songs just sitting on your hard-drive that you don't know what the hell to do with. Well, why not mix them into other unfinished songs and give them a better life, you know - instead of just letting them gather dust. Most of the tracks in my videos are incomplete sketches of songs mixed together to make complete songs. I just spend about five minutes before hand mapping out some faders and effect parameters, hit record on a video camera and then try to do everything in one take. You seem to use different skins to colour code your Renoise instances. Do specific colours correspond to specific musical elements? The different colours are used to help emphasize the different instances. That's all – they're purely aesthetic. For me those colours do not have any real relevance to song syntax. Perhaps for someone with visual synesthesia there are some deeper connotations. All your projects seem to scroll by at a furious speed. What's wrong with a nice and steady 4 LPB? Well, I do like to be quite close to the canvas when I'm working on a track. After I get a basic workflow going, I'll speed the song up drastically. It's sort of like increasing the resolution of the track so that you can fit lots of tight edits into your patterns. I'm finding myself less and less conscious of the speed I'm working at these days, but one thing's for sure - my tracks keep getting faster. Speed! It's like some weird addiction spiraling out of control. Maybe seeing those little numbers traveling upwards on the screen at that speed stimulates a part of the brain associated with visual processing and pleasure? I don't know. Well, whatever the reason, the dizzying tempo helps me to stay on task and complete songs faster. How did you first find out about Renoise? For quite a few years I was running a sound tracker called Player Pro 5.9 on my Mac. This tracker was good, but had very limited tech support and eventually died a horrible death in 2002. Then I remembered my friend Dac telling me about a fast tracker type clone that was under development. He said that it would soon to be ported to Mac. I kept my eyes on the Renoise website and when the first version became available I downloaded it. I've been using it ever since. What are your thoughts in general about using Renoise as a live tool? Using Renoise as a live tool is getting easier by the day. I use it to DJ my tracker files. I like being able to drop out the drums in one track and mix in the drums of another. It's certainly a step up from just mixing one stereo track into another one. Of course I'm personally waiting for the day that a proper XRNS file mixing app or console gets invented. I mean it's not exactly practical having 10 instances of Renoise open simultaneously for your live set, but it's definitely manageable. While some creative thinking is involved, creative tweaking in Renoise is usually implemented pretty easily. The developers have made everything so intuitive and simple. I've never felt frustrated with mapping anything. I just push command 'm' and assign. By comparison, I was using the latest version of a popular DJ mixing program the other day and was totally put off by how outrageously annoying the MIDI configuration set-up screen was. I felt totally restricted. I couldn't even use some features of this DJ program because only 'sponsored' controllers were allowed to use those MIDI assignments. Sponsored controllers only?! Ha. Ridiculous. Makes me proud to support companies like Renoise that are not exclusive to particular brands. Did the 2.6 release with the new scripting support influence the way you use Renoise with the Ohm? No. But, I think I'm heading in a different direction right now. We'll see. I like the Bird of the week feature of your blog. So, as a final question: what's your favourite bird? The Tawny Owl. Because it lurks ominously. "First!" I liked this interview. HITORI TORI ROX! Think you just made me take a big step closer to finding out what hardware to get next. Hmmmm ? Nice set,but not my type of music. Too paranoid ! i was really waiting for another in:depth, and it did not dissapoint. thanks for the interview! "All your projects seem to scroll by at a furious speed. What’s wrong with a nice and steady 4 LPB? Well, I do like to be quite close to the canvas when I’m working on a track. After I get a basic workflow going, I’ll speed the song up drastically. It’s sort of like increasing the resolution of the track so that you can fit lots of tight edits into your patterns." I know what you mean. I do it sometimes too. ah ah ah ah ah ah ah ah ah ah ah ah ah ah ah ah ah ah. At first, watching this guys hands, I thought that the video was sped up, to look cool, but man, it's real speed. That guy is FAST!! !